Drake Maverick narrates as he announces a number one contender match tonight between Cedric Alexander, Akira Tozawa, Humberto Carrillo, and Lio Rush. Good match. The main draw seemed to be whether or not Kanellis could finally get a win. The tension wasn’t great, but the actions was good. Ariya Daivari yells about supporting Hideo Itami when Itami kept blowing opportunities. Daivari says if you want something done, you have to do it yourself. 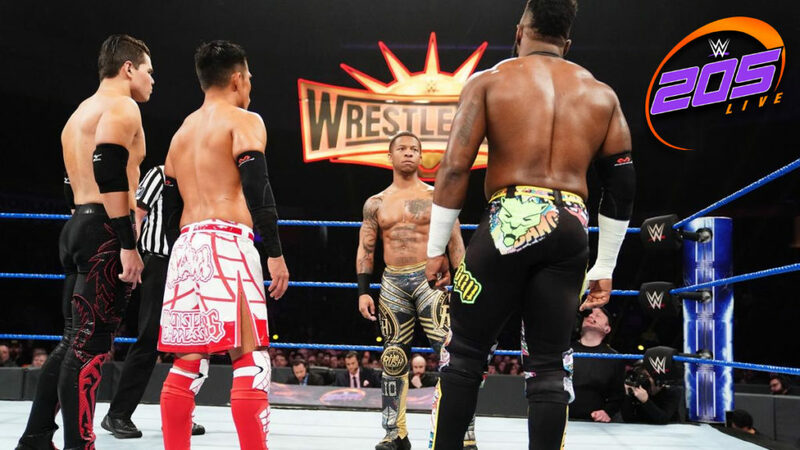 Lio Rush says that none of his opponents are ready for him tonight. Kendrick speaks on behalf of Akira Tozawa. Tozawa has just been scratching the surface. Tonight he moves on to face Murphy. Tozawa says he has never faced Murphy one on one, but he knows he can beat the champ. Humberto Carrillo learned a lot when he pushed Murphy to the limit. At Elimination Chamber, Carrillo will become champ. Cedric Alexander says this time last year, he outlasted fifteen men to become champ. Tonight, he only has to outlast three. Drake Maverick tells Drew Gulak and Jack Gallagher that they cannot accompany Carrillo to ringside tonight. They’re both upset, but they both leave. Noam Dar walks up and says he’s ready to compete, and he wants a match with Tony Nese. Maverick says Nese is suspended, but Dar demands a match. Maverick relents. Maverick makes a no DQ match between Dar and Nese for next week. Great match. There were some fun moments (like Rush mouthing off right at the beginning of the match), some drama (like Alexander slipping off the ropes and hurting his knee), and a ton of very fast-paced and exciting actions. There were tons of multi-man sequences that worked, for the most part, perfectly. I’d definitely watch this again. After the match, Buddy Murphy congratulates the winner on his victory. Murphy says he won’t be looking past his title defense at Elimination Chamber, but he’s going to be looking through his opponent and towards Wrestlemania. This was a good show pretty much exclusively for the main event. The opneing match was good, but it felt like more of the same from last week. I understand that the opening match is intended to build Kanellis’s story, but that doesn’t make the result any more or less exciting. The main event more than made up for any shortcomings though. I was very happy with this match is all ways.